You can neither see nor hear them when they are being used. And yet they are the true masters when it comes to reducing set-up times: The Zero-Point clamping system from AMF. With it, set-up times can be reduced by as much as 90 per cent. This has gone down well with the people in charge at MATSUURA. For their revolutionary hybrid machines which combine additive and subtractive methods, the AMF Zero-Point system ensures that everything runs quickly and seamlessly and that the cost-effectiveness is right. "The AMF Zero-Point system makes the set-up processes in the systems of our Lumex range demonstrate maximum levels of repeat accuracy, process reliability and efficiency", enthuses Holger Hermann, Head of Application Engineering for AM Technology at MATSUURA Europe GmbH in Wiesbaden, Germany. In this way, the clamping experts from AMF (Andreas Maier Fellbach) once again prove that they are at the apex of development with their clamping modules specially developed for additive manufacturing. This is especially the case since the Lumex systems do not represent conventional machines for additive manufacturing, if such a young technology can even be mentioned using such terms. With the hybrid additive manufacturing systems of the Lumex range, MATSUURA unifies selective laser sintering (SLS) and high-speed milling (HSM) into one machine. Through this combination of laser sintering and high-speed milling, components can be fully processed on one machine. Extra finishing work by means of other processing methods on other machines is only necessary where there are special requirements. The AMF Zero-Point system brings with it the best conditions for both sides of production. In the method offered by MATSUURA in two Lumex machines, unique up until now, metal powder is turned into any three-dimensional shape desired by means of selective laser melting in the powder bed in layers. In this process, a mirror galvanometer directs fibre lasers 500 or 1,000 watts in strength, depending on the design of the machine, to the intended point with fine precision. After every pass, the scrapers spread the metal powder out again on the machine table that has been moved downwards and away. On the face of it, this is a 3D printing process, as people would understand it. However, after ten powder layers each with a layer thickness of 50 µm, something special happens. The base or substrate plate does not move downwards another time so that the coater can apply the next layer of powder. Instead, it stays where it is for the time being. The milling head emerges "from the depth of the space"
It pops out of the void of the milling head, whose high-performance spindle accelerates the cutter to up to 45,000 rpm. It then moves along the outer contours and rough-machines a section of the allowance with an R2 ball cutter, for example. "Milling can not yet be performed to the final dimension, however, since the hot material is still cooling down and the geometry is therefore still changing", explains Hermann. This process is repeated for all ten layers generated by the laser. A tool changer holds 20 tools at the ready for this purpose. Amongst them are pre-cutters for rough-machining the machining allowance generated by the laser melting. After three times ten layers – or 1.5 mm – the final contour is created with the finishing tool at the points at which the component has cooled down somewhat. "In comparison with a pure AM process, here we achieve greater precision, especially in places which are subsequently difficult to access, or which can no longer be accessed at all", ensures Herrmann. This goes down to 0.005 mm and down to Rz 3.5 µm compared with 0.05 mm and Rz 25 µm. Furthermore, everything that is made possible by the ideal design options – such as cooling ducts in tool and mouldmaking – cannot be acknowledged exhaustively here. Thus, in most cases at the end of the processes, the machine-finished component with the base plate can be approved by the AMF zero-point modules. So far the attention has been on the visible operations at the top area of the machine table. What has been going on in the substrate in the meanwhile remains hidden from the observer, but is no less critical. The zero-point clamping modules specially tailored by AMF for additive manufacturing meet the specific requirements and accelerate the set-up processes involved. Carefully selected materials and processes are used here so that the zero-point clamping modules can defy the sometimes adverse conditions. For example, very high temperatures prevail in the 3D printing process. At the melting point of the metal in the powder bed it is 1,400°C. Even if the clamping modules are underneath a 30 mm-thick plate, temperatures of up to 150° and higher still occur there. AMF therefore uses seals and media which can withstand this. In order for process reliability and repeat accuracy not to suffer from the temperature fluctuations due to the constant heating up and cooling down, the Fellbach operation uses carefully selected materials and processes. This is the only way the zero-point clamping modules can meet the requirements. Hardened surfaces are just one example in this regard. And then they have to satisfy the usual requirements of the subtractive manufacturing processes. 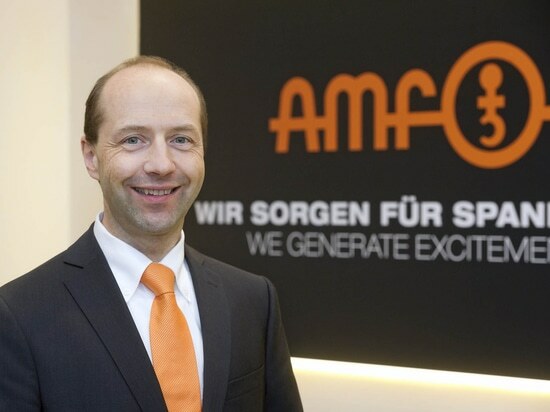 "But that is of course no problem", reassures Manuel Nau, Sales Manager at AMF, "because that is where we come in". K5.3 built-in clamping modules from AMF are used in the Lumex models from MATSUURA for additive manufacturing. 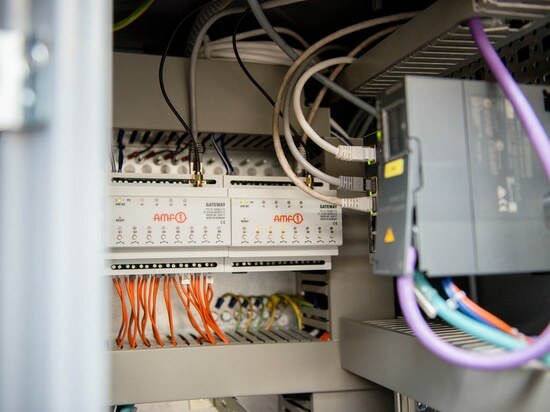 They open pneumatically at an operating pressure from 5 bar, which is available in every production hall – and this happens with just one connection. Five modules pick up the clamping bolts, which are housed under the 3D base plate. This is more or less direct workpiece clamping. "This is because our customers from tool and mouldmaking do not subsequently cut the base plate off from the finished 3D product at all," stresses Herrmann, who cites subsequent warping of most hardened shapes as the reason for this. The K5.3 built-in clamping modules achieve draw-in forces of 1.5 kN and holding forces of 13 kN. Locking is performed through spring force so that, following the opening and insertion of the clamping bolts, the pressure pipes can be disconnected at any time. Due to the optimal contour of the clamping bolt, a tilt-free retraction and extension, and thus a secure locking of the clamping modules, is ensured – even if the plate has been put on with a slight incline. 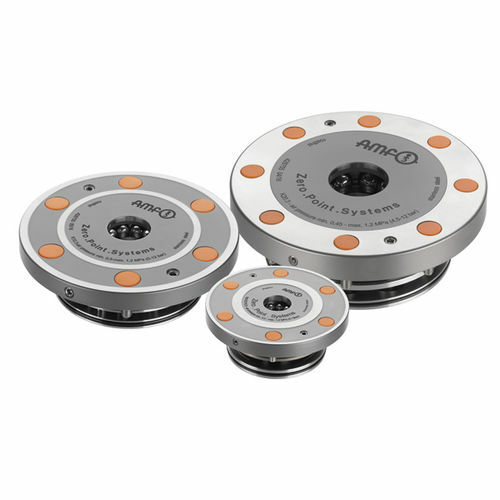 The optional, integrated blow-out mechanism of the clamping modules and a contact control mechanism for querying as part of automated processes are not installed in the Lumex systems, but can be supplied by AMF from the factory at any time. Under no circumstances does MATSUURA wish to relinquish the speed it can achieve during setting up with the AMF Zero-Point system, however. Herrmann also explains why: "By reducing the production time by up to 65 per cent, such as with injection moulding tools for example, with the hybrid method, we are offering our Lumex customers an enormous efficiency advantage. Here, the Zero-Point system from AMF offers an optimal supplement for many applications which contributes to the efficiency of the entire process". Before the AMF sales engineer, who has long been acquainted with MATSUURA, had suggested the zero-point solution, clamping had been performed laboriously with conventional technology. Back then, the base plate was bolted down to the machine table with four screws and aligned every time with the dial gauge and calibrated with a zero-point sensor. This cumbersome calibration process had to be performed repeatedly for every component. "With the AMF Zero-Point system, the set-up time can be reduced to a tenth of the time", buoys Herrmann. For Günter Brunn, the MATSUURA sales manager, the equipping of the Lumex machines with the AMF Zero-Point system represents consistency. "Through the lightning-quick set-up operations, we are signalling to our customers right from the clamping stage that they are in the Champions League with our Lumex systems and have an advantage in terms of efficiency". The fact that a part of this champion operates in the substrate and cannot be seen most of the time does not pose a problem for Manuel Nau: "We know about the strengths of our zero-point clamping technology, and also with regard to the difficult field of additive manufacturing. This is where we delight in impressing with the unbeatable fact of time-saving". For MATSUURA, the Zero-Point system from AMF offers an optimal supplement for many applications, which contributes to the efficiency of the entire process. With the AMF Zero-Point system, the set-up time can be reduced to a tenth of the time. The milling head: Whose high-performance spindle accelerates the cutter to up to 45,000 rpm. With the Lumex hybrid additive manufacturing systems, MATSUURA unifies selective laser sintering (SLS) and high-speed milling (HSM) into one machine. 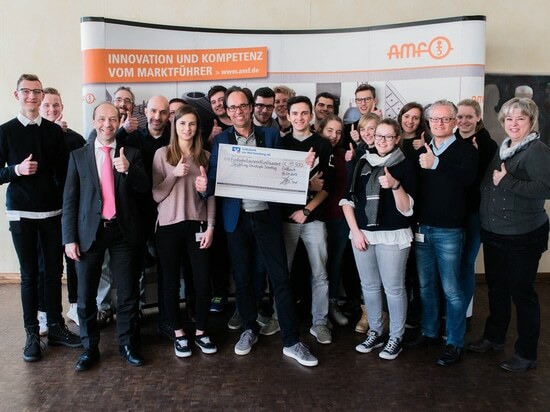 Stiphtung Christoph Sonntag (the Christoph Sonntag Foundation) is delighted about the €15,500 donation from AMF's trainees. Stiphtung Christoph Sonntag (the Christoph Sonntag Foundation) is delighted about the €15,500 donation from AMF's trainees. Communicate query positions wirelessly in production. New to our range are the AMF wireless sensoring systems. With them we offer wireless communication technology for production environments. For the fourth time in a row, Andreas Maier GmbH & Co. KG wins an international leading design award the winners of the German Design awards 2019 are firmly established.